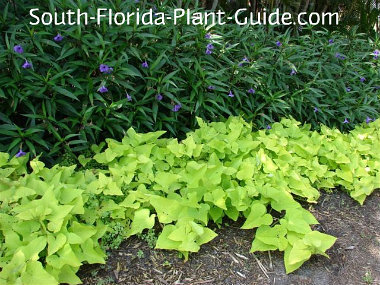 Garden show-off sweet potato vine is a very popular groundcover for its beautiful bold color and fast growth habit. Covering a large area in a hurry, this eye-catching groundcover is available with showy chartreuse-yellow leaves or dark purple foliage. These plants even produce an occasional surprise flower in soft lavender-pink. Flowers look like morning glories since this plant is a cousin. 'Marguerite' is the yellow variety and the purple has names like Blackie, Black Heart and Ace of Spades. 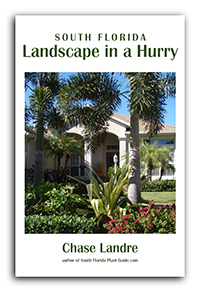 You can mix the yellow and the dark purple for striking contrast, or choose just one color to accent your landscape. There's also a lesser-known variegated variety with dusty gray-green leaves with purplish-pink accents. 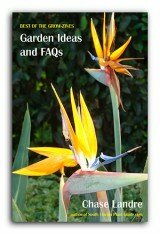 These plants can be used at the front of the border or fillers for open areas. They also make great container plants. They look great in spring, summer and fall but once winter temps hit, the plant often loses leaves or even dies back. 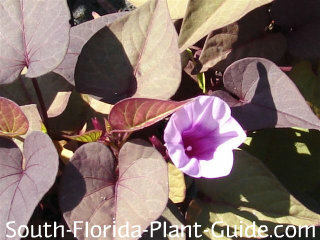 Sweet potato vine is grown for its showy foliage, not for its potatoes...though it will grow potatoes. They're edible but said to be not very tasty. Sweet potato is a fast - you might even say rampant - grower, staying fairly low to the ground. It's happiest in sunny areas. 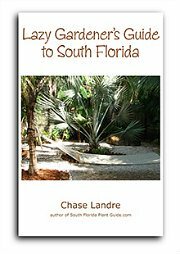 Many gardeners feel it does best in a partial sun situation where it gets a bit of afternoon shade. This plant is tropical by nature and prefers Zone 10 temperatures. Even there, winter usually takes its toll on the plant and can leave it looking scraggly. Well-established plants will come back in spring, and in Zone 9B containers of these plants can be moved inside during cold weather. Trim the edges as needed to keep the plant in bounds. Water regularly. This groundcover needs good irrigation especially when growing in full sun. Fertilize in spring or early summer with a good quality controlled release fertilizer. Place these plants about 3 feet apart...they will fill in quickly. Try to allow at least 2 feet between a sweet potato vine and the nearest shrub. Come in from walks and drives 2-1/2 to 3 feet. These plants make ideal container plants for window boxes, surrounding a tall center plant, or spilling out of hanging baskets. COMPANION PLANT SUGGESTIONS: Use with plants that won't be overwhelmed...things like bush allamanda, yesterday today and tomorrow, red cluster bottlebrush, green arboricola, Super King ixora, and ruella.